Thursday, February 3: Today is the Lunar New Year in Japan, but I’m so clueless I don’t even realize it until the afternoon. I know the Lunar New Year is in Korea on these three days because I have a school holiday. But when I ask the owner of the guesthouse which day is the New Year in Japan, he says January 1, and he looks at me like I’m crazy for asking. So I think, how strange…. Japan must not celebrate the Lunar New Year like Korea does. I start off on foot to nearby Daitoku-ji, a complex of 24 Zen sub-temples, perfectly manicured gardens and wandering lanes that lead only to blocked paths. 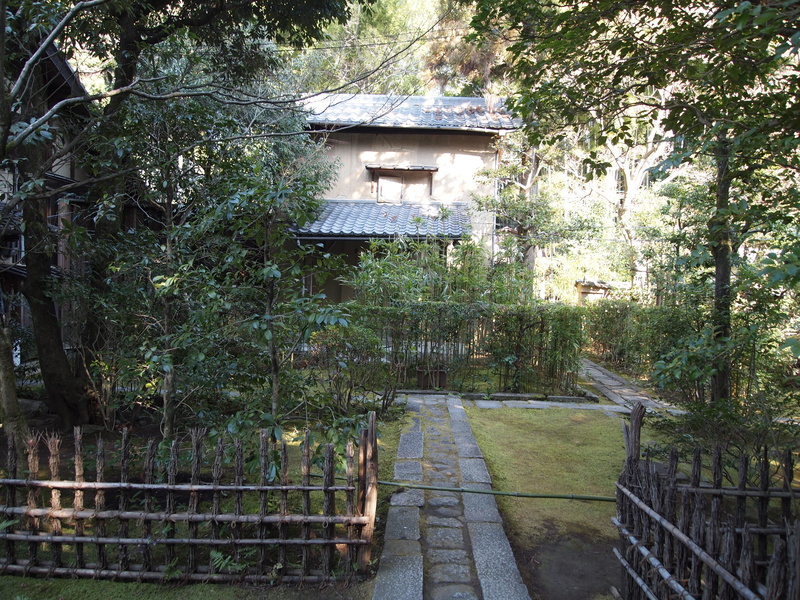 Daitoku-ji is the headquarters of the Rinzai Daitoku-ju school, so it’s purportedly a good insight into Zen culture. I don’t find it much of an insight into anything. Every path I follow leads to a sign that says “No Entry.” I walk down numerous walkways only to be met time and time by this sign, which makes it not a very welcoming place. The gardens I can glimpse here are perfectly arranged, with a mixture of low ground cover, variegated leaves, bushes, trees, and little gates made out of straight tree branches, lined up like the teeth of a comb. Dark wood temples with white panels blend in with nature in a surprising harmony, punctuated by bright red carpets on the verandas. Moss-covered grounds glow with sweet beckoning. Off the beaten track, I encounter a small bamboo forest where light slants down in sharp knife-like precision, casting blades of sun on the ground. While walking its paths, I encounter an impeccably dressed older couple out for a stroll. He is dressed in a long cashmere coat with a silk scarf tied neatly around his neck; the woman is also precisely and immaculately dressed and manicured. It’s as if they tucked out of a meeting of high-level diplomats to share a few romantic moments together. The man asks me many questions about my life in perfect English and wishes me a wonderful trip through Japan. After spending too much time at Daitoku-ji meeting dead ends, I finally make my way out and catch a bus to Kinkakuji Temple, the one to which Yeong-ung Song wanted to accompany me yesterday. Kinkakuji is a Zen Buddhist temple known as the Temple of the Golden Pavilion and is one of 17 World Cultural Heritage sites in Kyoto. 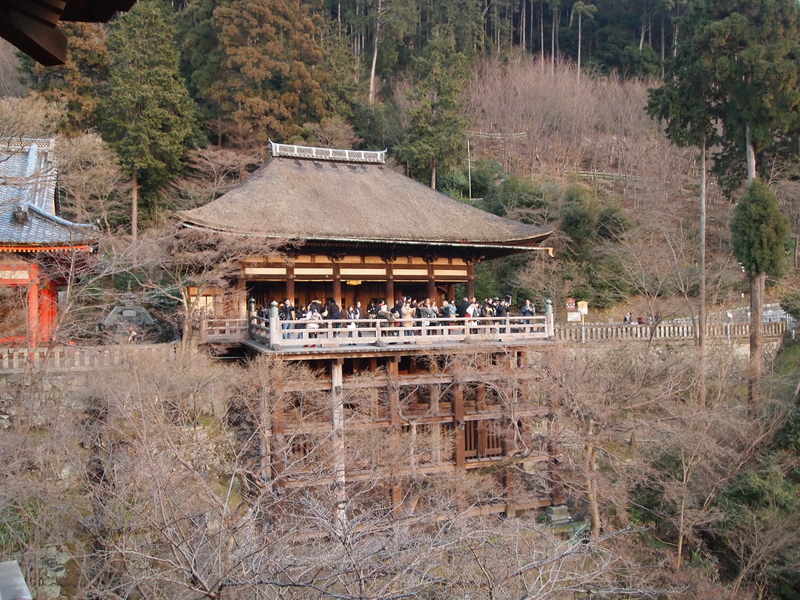 It is also one of the most popular buildings in Japan, second only to Mt. Fuji in the number of tourists it attracts. The Golden Pavilion is a 3-story building, the top two stories of which are covered with pure gold leaf. Originally built in 1397, the present building was reconstructed in 1955 after a mentally ill man burned the original down in 1950. The building supposedly houses Buddha relics, specifically Buddha’s ashes. 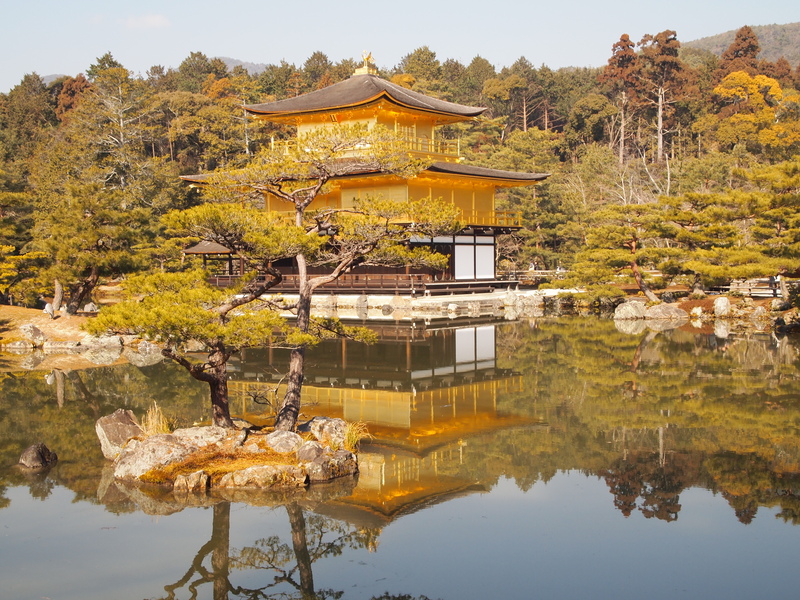 The Golden Pavilion extends over a lovely pond that reflects it in all its gleaming gold. It’s absolutely stunning and people are standing on the edges of the pond, admiring its beauty and taking photos. I wander around admiring the picture-postcard beauty and follow the crowds further along the path until I come to a temple decked out in colorful banners of silk and paper lanterns inscribed with Japanese letters. In front of the temple is a covered pot full of sand; people are lighting sticks of incense and offering prayers as they stick them into the sand. It’s a festive atmosphere because, surprise (! 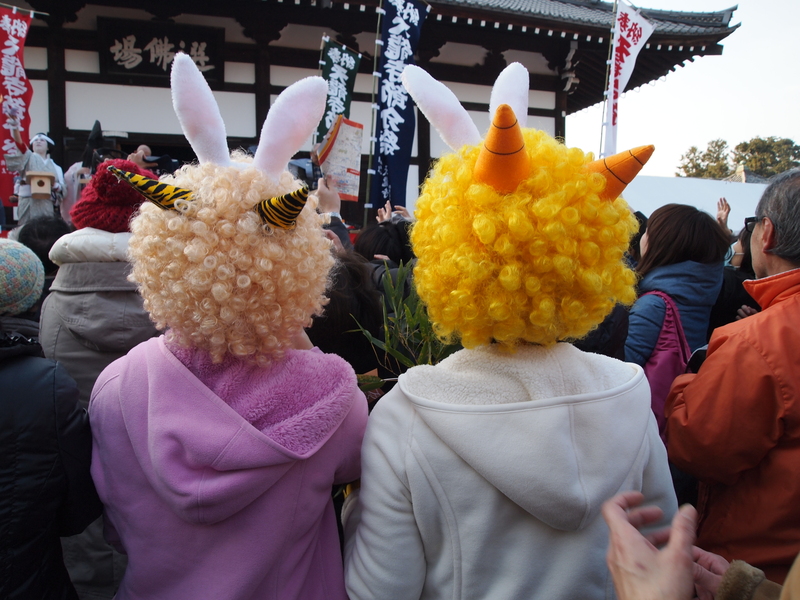 ), this is the Lunar New Year and people are celebrating. This year, 2011, is the Year of the Rabbit. The rabbit largely represents tranquility and calm. Coming between the Year of the Tiger and the Year of the Dragon, which are both known for their global tumult, 2011 promises to be a year of relative calm. (This is what Chinese astrologers predict prior to the tsunami that hits Japan on Friday, March 11, 2011.) In Japan, people busily prepare for the New Year by cleaning house and buying/cooking food (osechi) to welcome the “god of new life”. Further along the path, I stand at a table where all kinds of Japanese delicacies are offered for sale. 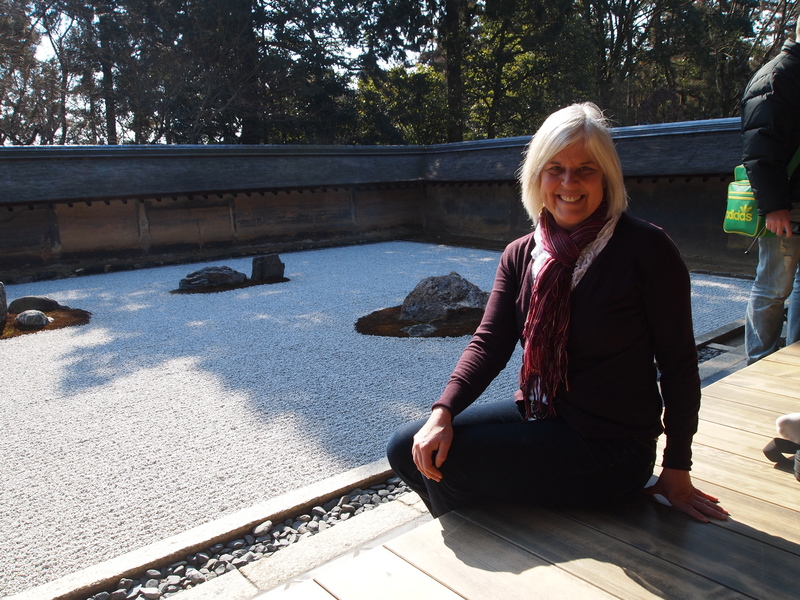 I sample some wasabi peas beside an American woman named Holly; we strike up a conversation and then wander around the Kinkakuji gounds and the little islands and take pictures. It is so lovely here, even in winter; I can imagine how gorgeous it must be in spring with all the flowers and trees in full bloom. 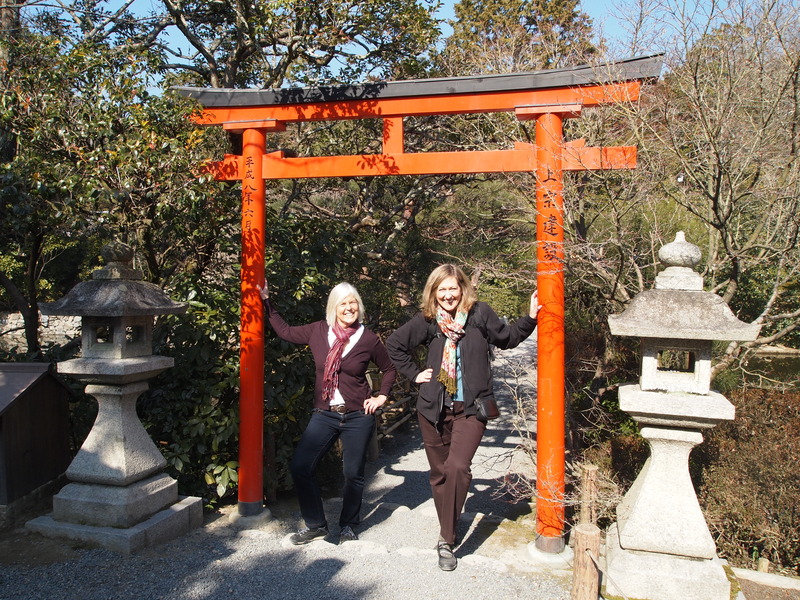 Later, Holly and I seek a bus together to Ryoan-ji, or Temple of the Peaceful Dragon. 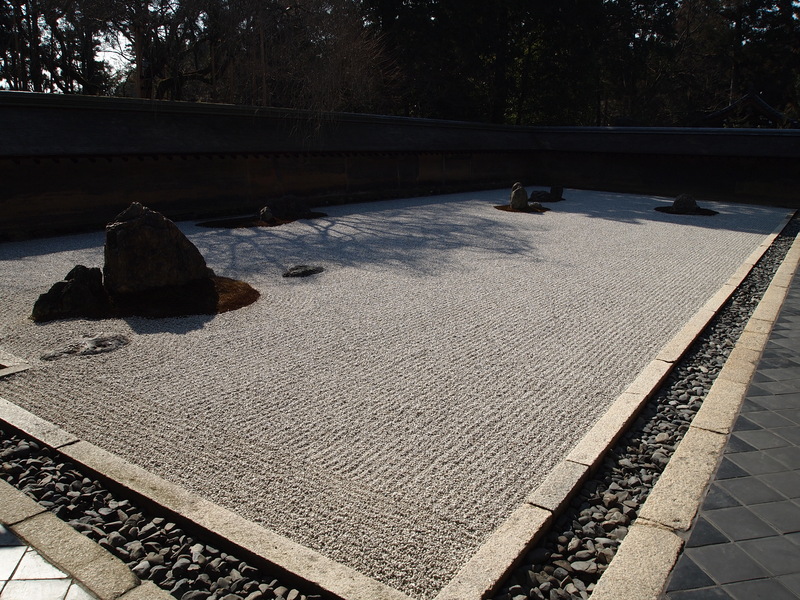 This is home to the famous and celebrated rock garden, the symbol of Kyoto, that draws tourists in droves to contemplate the emptiness between the rocks. It’s an oblong of meticulously raked sand with a formal collection of 15 strategically placed rocks on little beds of moss, apparently afloat in this sea of sand, and hugged by an earthen wall. The unknown creator of this garden left no explanation to its meaning, but tourists flock here to see this interesting but austere arrangement. Apparently it causes photographers fits because it is impossible to capture the entire garden with all 15 rocks in one photograph. Apparently no matter where you sit, you can see only 14 rocks at one time. There are no trees or plants, just moss and white stones and beautiful seasonally changing trees behind the surrounding wall. This temple was designated a World Heritage site by UNESCO in 1994. 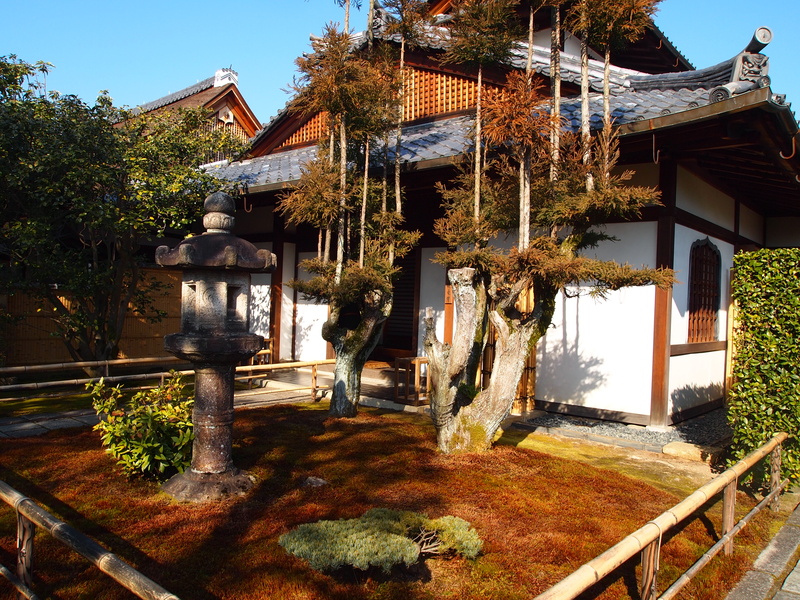 We sit for a while admiring the beauty and mystery of this place, then walk around the veranda of the temple admiring the lovely paintings in the tatami-matted tea rooms. While here, Holly and I strike up a conversation with a Canadian couple who teach English in Korea, near Seoul, and we compare our stories of teaching in Korea. I have it in my head to go to Arashiyama. Neither Holly nor the Canadians want to come along, so I head off on a quest to find the Randen Railway Kitano line at Ryoanji Station. It’s an electric railway that connects the center of Kyoto with the western suburb of Arashiyama, and it must be the cutest little train I’ve ever seen. 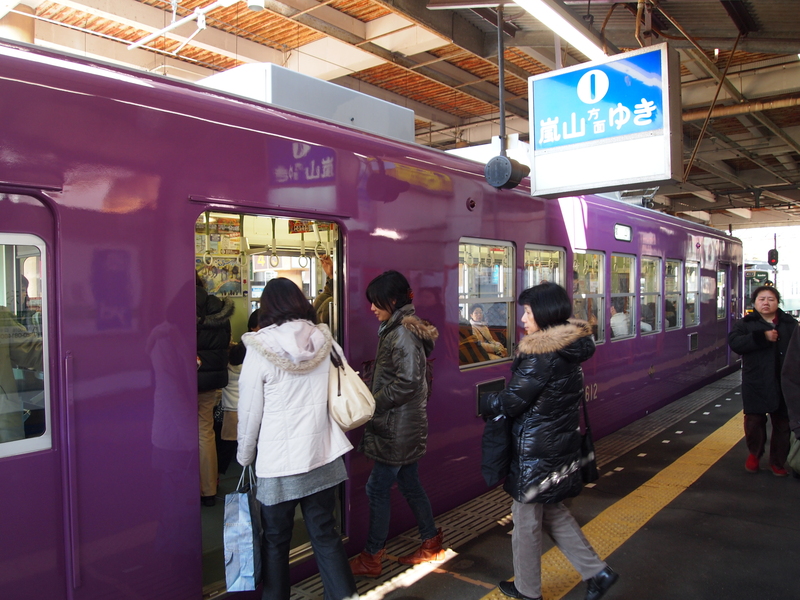 It’s painted a cheery purple color and consists of only one car, driven by a pressed and uniformed driver with a little conductor hat and white gloves. It makes a clanging noise as it rumbles along the tracks and drops me eventually in the suburb, where I wander down the street, captivated by pretty little thingies in shop windows. 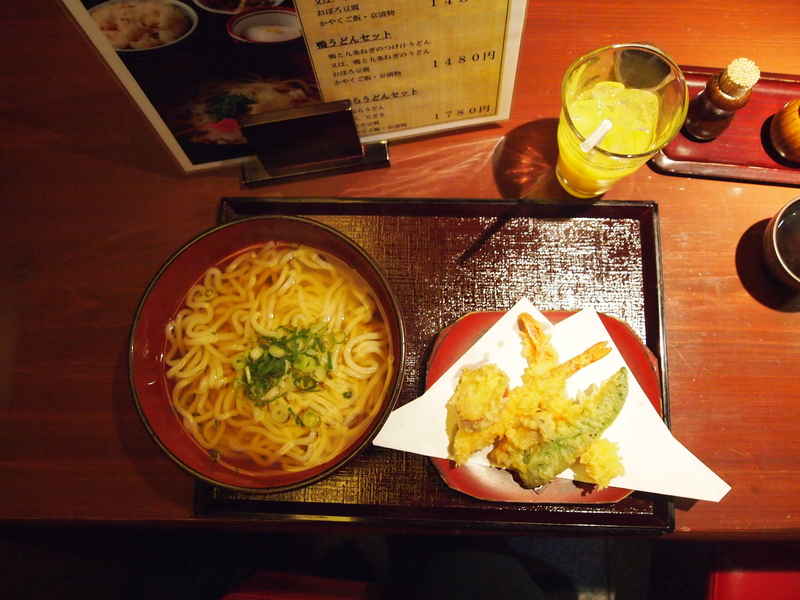 I find a cozy little lunch spot, where a Japanese mom is openly nursing her baby, and enjoy a lunch of Udon noodles and shrimp and vegetable tempura. 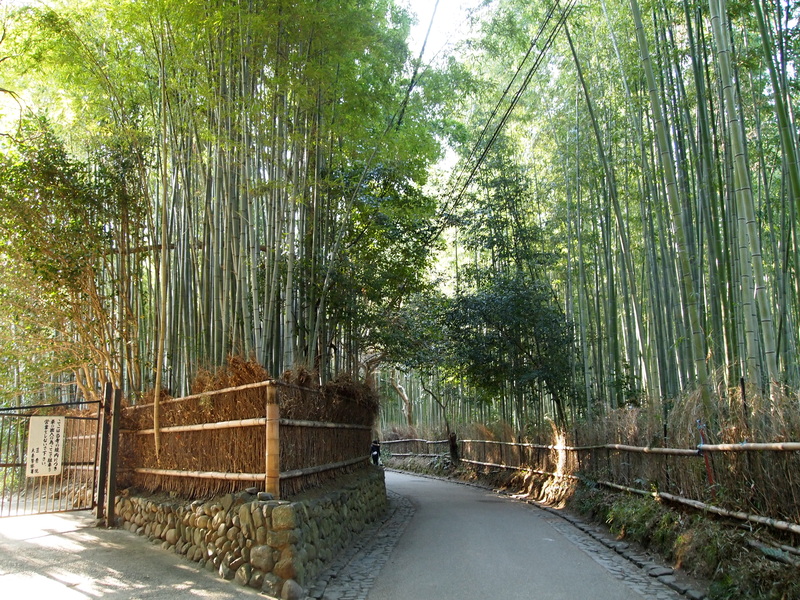 On a full belly, I wander down the Path of Bamboo, a quiet and beautiful oasis where groves of bamboo reach to the sky and sway in the breeze. The bamboo turns the sunlight into pale green streams that make the place seem ethereal. 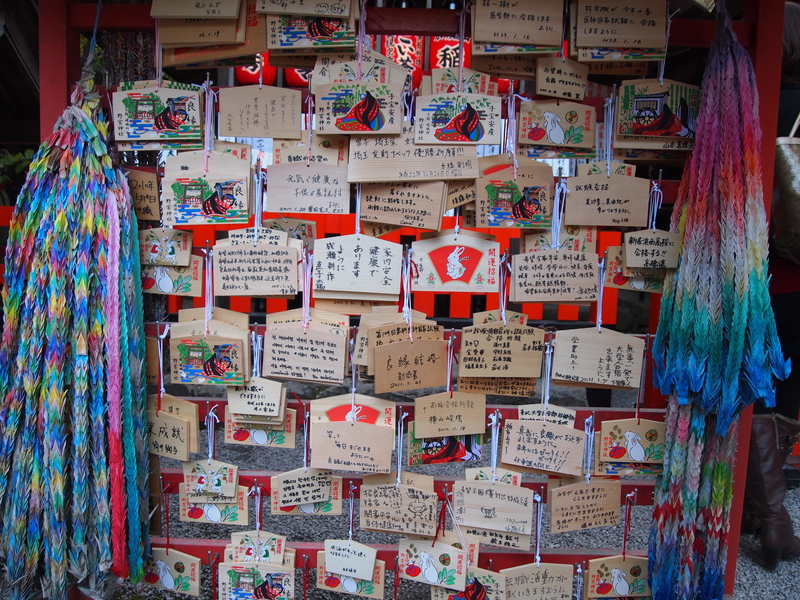 It’s quiet, but eventually I come to a group of little temples called Nonomiya… place of fortunes, wishes, and gratitude. 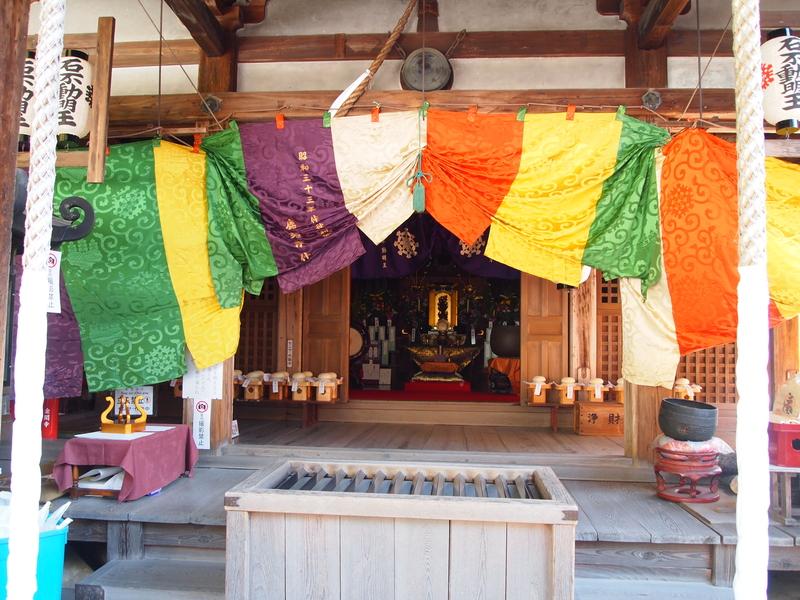 It’s a small shrine located in the midst of the famous bamboo forest. 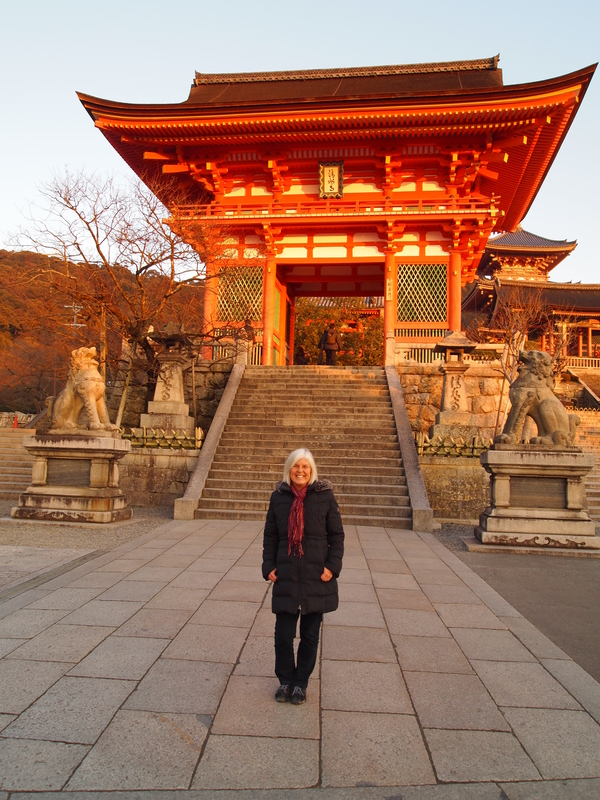 It was here that women were once trained prior to becoming shrine maidens at the holiest Shinto Shrine in Japan. This is a time I wish I had a guide or that I could read Japanese, because there are small open pavilions with piles of rectangular wood pieces covered in Japanese writing, house-shaped wooden plaques with paintings and writing on them and hung with ribbon, bright red lanterns covered in Japanese letters, and people paying respects at all of these little stops. I don’t know what they’re doing, what they’re praying about or wishing for. I am clueless but I really wish I knew what was going on. This is when Japan seems like a little secret world full of lovely things that I can’t quite reach. After leaving this little place, I go down the street a bit to Tenryuji Temple, another of Kyoto’s UNESCO World Heritage Sites and the main temple of the Rinzai sect of Buddhism in Kyoto; it’s also considered one of Kyoto’s Five Great Zen Temples. There is a big celebration going on here for the Lunar New Year, with fires burning, people carrying long branches from some kind of tree, and people dressed up as fairy tale or cartoon characters. Over a loudspeaker is blaring the song: “We are the world. We are the children,” the famous charity single recorded by USA for Africa in 1985 and written by Michael Jackson and Lionel Richie. It’s a festive atmosphere. I find myself in the midst of a crowd gathered to listen to a bunch of robed and official-looking speakers who, after their speech, throw paper fortunes into the crowd. While I take pictures of the costumed spectators, someone thrusts a paper fortune into my hand, which of course I can’t read. But I’m happy to be included in the New Year’s good fortunes. After wandering around Tenryuji for a while longer, into little secluded courtyards where people are making offerings of all sorts, I leave and catch the electric car back into the center of Kyoto, where I head to Kiyomizu-dera temple , an independent Buddhist temple in eastern Kyoto. It’s part of the Historic Monuments of Ancient Kyoto UNESCO World Heritage Sites. It was founded in the early Heian period and the temple dates to 798, with the present buildings constructed in 1633 during a restoration. Apparently, there is not a single nail used in the entire structure. Kiyomizu means “clear water” and takes its name from the waterfall within the complex, which runs off the nearby hills. The main hall has a large veranda, supported by tall pillars, that juts out over the hillside and offers impressive views of the city. On the veranda, a crowd of people has gathered to watch the sunset. Beneath the main hall is the Otowa waterfall, where three channels of water fall into a pond. 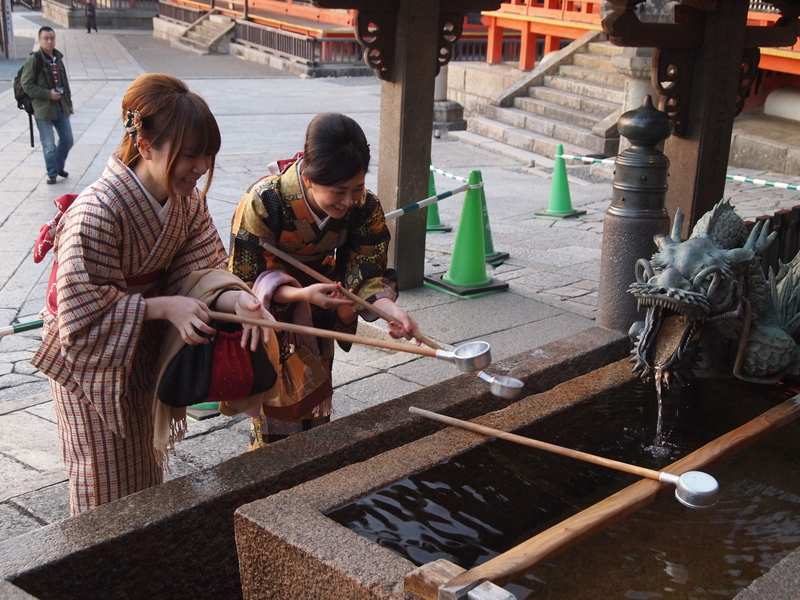 Visitors are catching and drinking the water with long-handled scoops. Drinking the water of the three streams is said to confer wisdom, health, and longevity. However, some say that if you’re greedy and drink from all three, you invite misfortune on yourself. I am exhausted from traipsing all over Kyoto today, so I take the bus back to Daitokuji , where I go into the Trader Joe’s-like market and buy bread and cheese and a beer and walk back down the shopping street to my little hippie commune. There, I eat my dinner in the common room and chat with some more Koreans who have come to Japan for the New Year holiday. One girl I meet, JiYoung Lee, is doing a kind of internship at a bakery in Kyoto and has been here a couple of weeks. She wakes at 3 a.m. each morning to go to work at the bakery and she hasn’t ventured out much. She asks me what I’m doing tomorrow and I tell her I’m planning to bicycle around Kyoto. She asks if she can come along and I say sure, she’s welcome to come. After dinner and checking emails, I turn on the heater in my room full blast, climb into my bedding on the floor, and continue reading my dear book, The Lady and the Monk, which continues to put a romantic spin on this place called Kyoto.